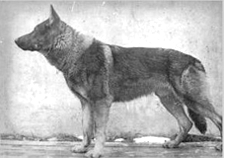 In historic terms the Czechoslovakian Vlčák is a relatively modern breed. Often called the Czechoslovakian Wolfdog, this term can present as both negatively ambiguous & detrimental to todays dogs, which are not wolf hybrids. 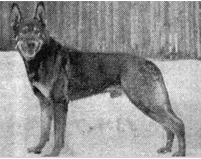 In 1955 Karel Hartl undertook a biological experiment in the then Czechoslovak Socialist Republic, to breed the male German Shepherd Dog Cézar to the female Carpathian wolf Brita - with the first litter born on 26 May 1958. The word 'experiment' is perhaps misleading as there was an intended purpose - to produce a robust, military working dog which would combine usable qualities & instincts of the wolf, with favourable qualities of the dog. The original mating established firstly - that progeny from male dog / female wolf & male wolf / female dog was possible & secondly - that offspring were themselves fertile & capable of successfully continuing the emerging breed. As might be expected, the first hybrid puppies closely resembled the wolf & in retaining much of their characteristic behaviours, were difficult to train. In adulthood, the first generation hybrid offspring were again bred with German Shepherds to decrease the wolf percentage. By third & fourth generation puppies, in addition to increased trainability, the evolving breed exhibited superior tracking skills, night vision & more acute hearing & scent capabilities in comparison to dogs. 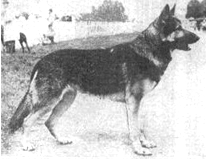 Founding female Brita was mated to a second German Shepherd male called Kurt, which created the basis of a second line & a third was created by breeding male wolf Argo with female German Shepherd Asta. 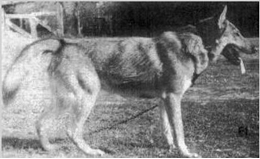 In 1982 the Ceskoslovenský Vlciak was recognised as a national breed via the general committee of the breeders' associations & officially recognized by Fédération Cynologique Internationale (World Canine Organisation) in 1989.